There is a lot of junk available nowadays since homemade espresso is so popular and everybody wants to sell their products. What Is Pre-Infusion And Does It Matter? To find the best espresso machine under 500 dollars, I highly recommend you to take a look at my comparison table below. A more detailed description of the table content can be found further below in case you want to know, for example, what the heck is a 3-way-solenoid. 15 bar pump drive (Gaggia 17 bar) – More in the post about t﻿﻿he best espresso machines below $200. Hot water dispenser – Get hot water to make a Cafe Americano or brew hot tea. Brewed Ice Coffee – You can make froth for cappuccinos with all three machines. I also plan to write detailed reviews of all three machines for you to get even more information so it’s worth to come back at a later time. If you want to make sure to not miss it, just sign up to my newsletter to be the first to hear about new posts and reviews about the best coffee makers and espresso machines! A PID controlled espresso machine like the Breville BES840XL will regulate the temperature in calculated steps until it has reached the perfect temperature. Without a PID, only a mechanical thermostat regulates the boiler. The consequence may be an unstable temperature balance which could negatively affect the taste of the espresso. Pre-Infusion is a set wait time where some water is added to the packed grounds before the regular pump process under full pressure is started. This may positively affect the taste of the espresso since all grounds are equally saturated which results in an even brew extraction. So in my opinion, yes it matters! Both the Breville BES840XL and the Gaggia 14101 Classic are equipped with a 3-way solenoid valve which releases the water pressure off the portafilter and bypasses it into the drip tray after the brewing cycle. The result is a dry coffee puck that leaves an almost clean portafilter after dumping the grounds. In addition, the valve closes automatically after the brewing process to eliminate the bothersome dripping through the brew group. Super slim design with only 6 inches in width to fit even into the smallest kitchen. In less than 40 seconds, you are able to start your first shot so it’s super fast. Various programmable features like change brewing temperature, volume of the shots and even adjusting water hardness for perfect descaling reminders(test strip included!). Automatic air and temperature regulation of milk frother for a perfect froth – ideal if you don’t consider yourself a “pro”. Chrome plated brass commercial sized and commercial weight porta filter and brew group for perfect temperature stability. Large diameter of the portafilter and large showerhead of brew group for perfect water distribution. Heavy duty stainless steel housing. The volume of the shots are pre-set but can be re-programmed. Pressurized and non-pressurized portafilter baskets included (two of each kind). Espresso pressure gauge for you to monitor espresso extraction pressure. Available in silver, red and black. All three machines are recommended but have different features you may prefer or not. Go for the DeLonghi Dedica EC680 if you have a small kitchen and want to enjoy your espresso at the push of a button. The Gaggia 14101 Classic is virtually an old-timer under the espresso machines and loved by coffee connoisseurs. The Breville BES840XL comes with a lot of features but is also the most expensive one. Plus it’s the only machine of the three that comes in different colors. 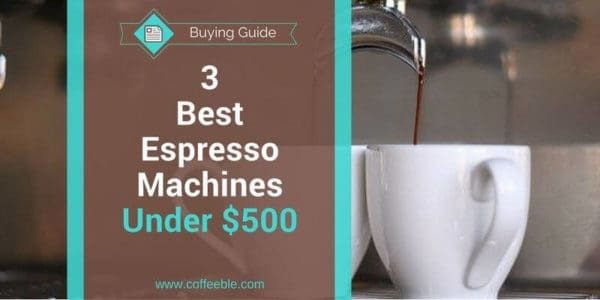 If you are still not 100% sure, check the table above again or visit my guide to find the best coffee or espresso machine and select the features which are most important to you! I would love to hear from you what you think is the best espresso machine under 500 dollars and why? Please leave a comment below!